...the Great Freedom Adventures bicycle tourist will discover splendid natural and architect enhanced landscapes, wildlife, history and art, at a pace that allows the beauty to be fully absorbed and appreciated. The bike tour operator who promotes freedom on two wheels, Great Freedom Adventures (http://www.greatfreedomadventures.com/), announces last-minute openings in two of its popular tour destinations. The first is the Islands and Seacoast Cycle Tour spanning four of New England’s most beautiful islands including Rhode Island’s Block, Conanicut and Aquidneck Islands, along with Massachusetts’ Martha’s Vineyard. The tour is timed to take advantage of post-summer-season quiet, farm-fresh produce and sun-drenched fields of pumpkins. Guests walk a wild flower-filled nature preserve during what is typically the peak of the monarch butterfly migration to Mexico. The second tour is the Hudson Valley National Heritage Area Bike Trip exploring the region’s wealth of natural beauty, history, art and architecture. This tour occurs under a canopy of fall foliage through sweetly scented vineyards and orchards. Guests may arrive a day early to take advantage of the finale of the annual Arts Walk in Hudson, NY on October 7th, featuring exceptional visual artists, performing artists, musicians, dancers and poets. Islands and Seacoast Cycle Tour – 6 Days/5 Nights; Sept. 16-21 at $2,595, single supplement $ 850. 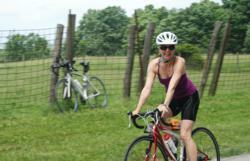 Hudson Valley National Heritage Area, NY Bike Tour– 6 Days/5 Nights; October 7-12 at $2,195, single supplement $475. For time-challenged travelers, the Hudson Valley tour is also being offered as two, three-day/two-night options, from October 7-9 or from October 10-12. The per person, double occupancy price for the short New York tour is $825, single supplement $275. On all trips, guests may use their own bikes or take advantage of a complimentary helmet and bike offer from Great Freedom Adventures. While biking is the main daily activity, none is a bike-compulsive itinerary. Company founder Jeanne Rummel has sleuthed out artisanal cheese-making farms, award-winning wineries, scenic hiking trails, iconic homesteads, heritage gardens and more to engage the curious in ways that allow them to discover new worlds. “These tours are ideal for travelers with varying interests because in the course of a day, the Great Freedom Adventures bicycle tourist will discover splendid natural and architect enhanced landscapes, wildlife, history and art, at a pace that allows the beauty to be fully absorbed and appreciated,” says Rummel. Upscale lodges mirror their locales and also bring authenticity to the regional travel experience. Multi-course dinners are provided at restaurants with world-class chefs utilizing fresh, local ingredients. The programs include all lodging, most meals, guides, van support, entrance fees where indicated and other region-specific costs such as ferries and side excursions. Alcoholic beverages and guide gratuities are not included. Great Freedom Adventures offers sensory-, body- and eco-friendly bike tours and multi-sport adventures in New England and New York in regions possessing a unique diversity of natural and cultural interests. The tours are distinguished by including a wealth of activities in addition to cycling such as kayaking, hikes, nature walks, history tours, sunset sails, demonstrations and others, which fully immerse the traveler in each destination to provide an insider’s perspective. The tours are three to six days long and are guided and supported. Please visit the website for additional information and for specific details on each tour. For information please see http://www.greatfreedomadventures.com or call (508) 545-1864 or (877) 545-1864.